Much has already been said about the strategic significance of the decision by the Greek people to reject the bailout and the terms of austerity it imposes. To me, the negative power of this vote in the face of rampant, destructive ideology finds its most resonant historical echo in a short phrase repeated over and over in Melville’s enigmatic novel, Bartleby, the Scrivener: A Tale of Wall Street. In this blog I have made a point of not reiterating points that have already been said, especially when I can’t articulate them better. So I defer to The Big Think. ‘In a story called Bartleby, the Scrivener, A Story of Wall Street, Melville gives us a portrait of a copyist – a thin, efficient, anonymous figure named Bartleby, who is in a sense a human photocopy machine. And in this story, Melville follows the benign, kindly reflections of an employer. An employer of a man who at a certain point decides he just doesn’t want to be a copy machine any more. But he can’t protest because he’s actually become too traumatized and frozen by what life has brought him so far. And so he becomes instead a fixture in the office, a burden, a constant moral reminder of all that’s wrong in the world, a symbol of a world turning people into human copy machines. The narrator of this story does everything any of us would do, and more, to try to solve the problem of this man he has employed who will no longer work. He’s just a burden on the payroll. What would you do if someone you fired wouldn’t leave? Melville tells the horrible, horrible story of a guy who’s laid off and is told to collect his belongings and leave. And he won’t leave. He’s there the next morning. In fact, he not only won’t leave his job; he won’t leave the office, and he begins to live there. Now that “I prefer not to” is one of the most mysterious and enigmatic sentences in American literature because just what it means to say, is not “I won’t do it, try to make me do it,” but I “prefer not to.” Really, that’s a sentence that really does ask questions about coercion in the work environment and how important it is, how much we cherish that code of manners and courtesies that create a pretense between employers and their employees, create the fiction between employers and employees that the employees have any choice in the matter. Well, Bartleby, the Scrivener presents the sort of nightmare scenario of your employee not getting it or deciding no longer to get it and no longer to say either, “Yes, of course, I’ll do your copying for you” or “Hell no, I won’t do your copying,” but instead appealing to you in a more human way. The story of Bartleby is of course a terrible one. Our narrator not only offers Bartleby the option of coming home to his own home. Because he cannot get rid of Bartleby he moves out of his own office. But Bartleby won’t leave then either and the next people who rent the office have Bartleby hanging around on the stairs. 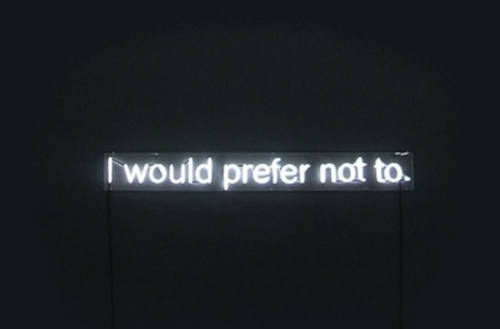 Bartleby is eventually sent to the tombs in New York, where imprisoned, he dies. What Melville says to us, reminds us of, is that our systems produce persons so damaged that although we may put them out of our minds, evict them from our offices, they are still there. And in some way we are accountable to them. And the sign that Melville has no terrific solution is that he ends the story, “Ah, Bartleby; ah, humanity.” Right? The parallels are obvious- Greece’s refusal to leave the Eurozone as well as to adhere to the bailout conditions, the ongoing downward spiral of its economy, the haunting sense of responsibility that begins to weigh on the EU just as it does on Bartleby’s employer and so on and so on. But what does that mean in Europe’s climate of political and economic turmoil? The celebration with which the vote was met represents perhaps and over-climactic waypoint following the fact that both Syriza and the EU have, over the last few months, failed to find a solution for the Greek people. But this is precisely the reason why it is so important- it represents the insistence of both the people and the party that represents them on the present impasse. And that impasse stands for the impossibility of capitalism, the contradictions of austerity and neoliberalism that the Greek people refuse to be held responsible for and will instead push back towards the very premises of the EU itself is operating on. We can ask ourselves about what comes next but right now I think we should bracket the future and dwell for a second on the space that the present moment opens up to us. The negative power of OXI is as clear and resounding as Bartleby’s refrain, and as Keat’s negative capability. It is a “no” that seeks no solution or particular course of action but is rather willing to see hope emerge out of the uncertainty which underlies economies around the world, and which the politics of austerity regularly cover up and exploit. It is a statement to which capitalism has no answer.